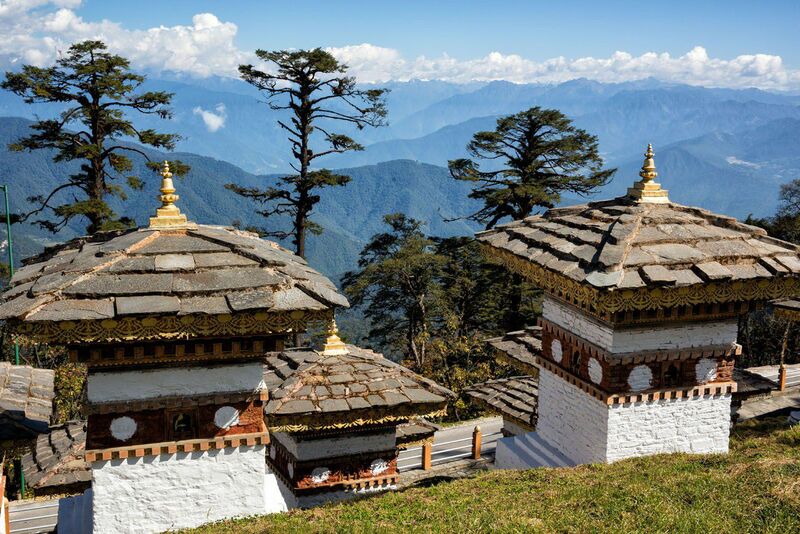 Bhutan is a tiny country that is nestled among the mightiest mountains in the world. 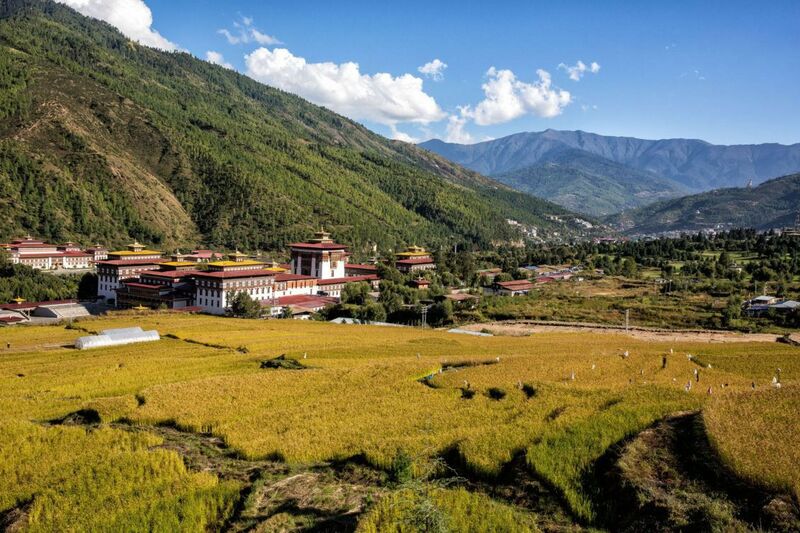 This is the land of dramatic mountain scenery, Buddhism, prayer wheels, dzongs, ancient traditions, chilies and cheese, rice terraces, and some of the most beautiful woodworking you will ever see. With one week in Bhutan, you can explore the cultural heart of this country, making memories that will last for a lifetime. 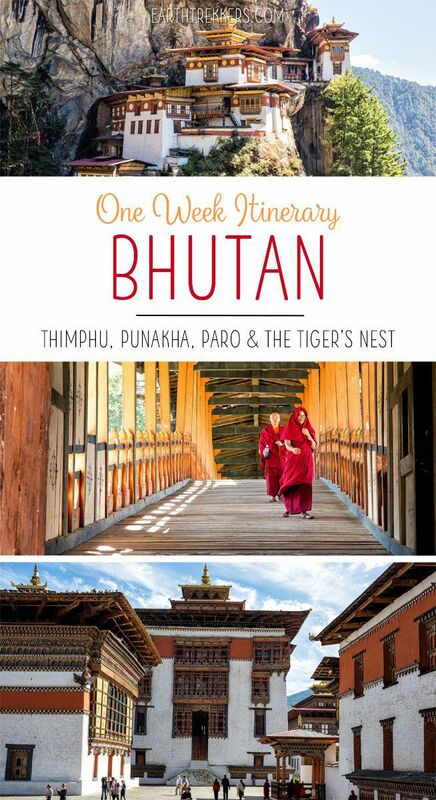 The 7 days we spent in Bhutan was one of our top travel experiences during our trip around the world. We fell in love with this country, with its landscapes, its people, and its culture. I hope we can return again someday. Before we get into the itinerary, it’s important for you to know about the national tariff. In order to visit Bhutan, visitors are charged a “minimum daily package.” This fee, $250 per day during the peak season months, is a non-negotiable fee that you must pay in order to visit Bhutan. 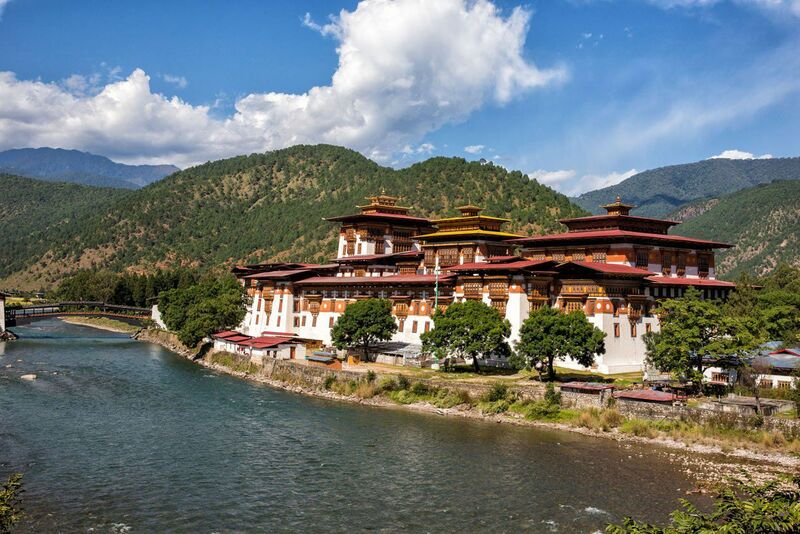 It sounds like a hefty fee, and in some ways it is, but this fee covers all of your meals, 3 star accommodations, your activities, transportation within Bhutan, and a licensed guide and a driver for the duration of your trip. What this fee does not include are flights and other modes of transportation into or out of Bhutan, and anything extra, such as snacks, alcoholic beverages, and certain activities. You are able to travel in small groups and make your own itinerary (or just follow this one!). You are not forced onto gigantic tour buses for sightseeing with twenty-five other people. For full details on the daily tariff, visit the Bhutan tourism website. For our family of four with two kids under the age of 12, we paid a daily fee of $750. Yes, it’s expensive, but was it worth it? Absolutely! Bhutan is an extraordinary place and well worth the visit. 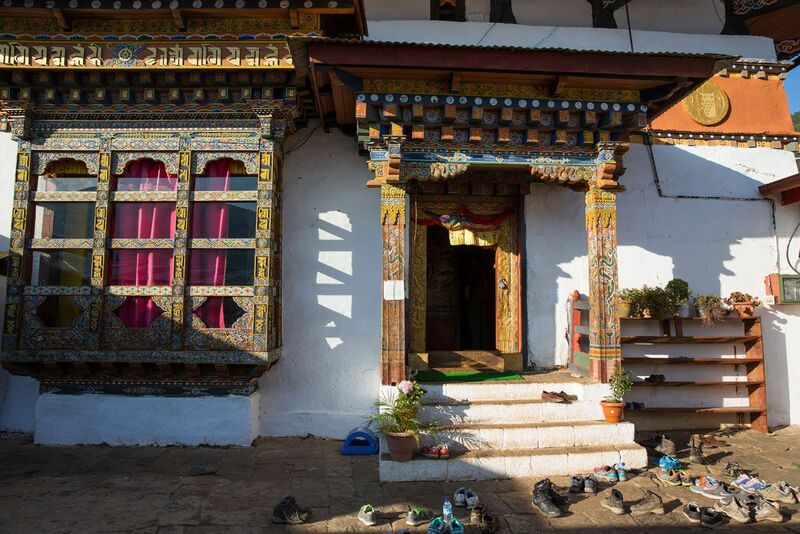 We look back on our one week in Bhutan with fondness and we dream of returning again someday. 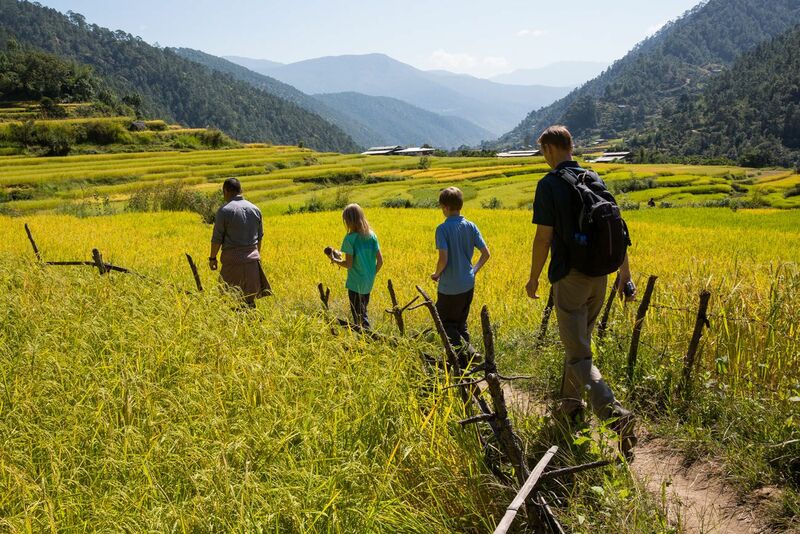 The daily tariff makes Bhutan one of the most expensive countries to visit, but what you are getting in return is a high-quality experience to a land that is very unique from almost anywhere else in the world. 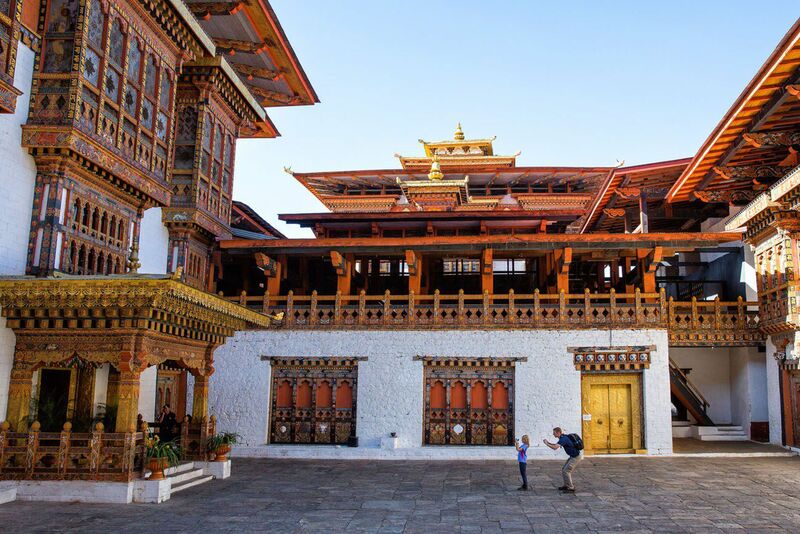 While planning our trip around the world, we wondered if Bhutan would live up to our expectations and if it would be worth the high cost of the daily tariff. During our trip around the world, we lived on a budget of $250 per day, so Bhutan was an enormous splurge. And it was worth every penny. If you’re wondering if Bhutan is worth it, check out our post Journey through Bhutan in Photos for some inspiration, or keep reading this post. Before you even set foot in Bhutan you get to see what dramatic place this is from the airplane. From your window, take in the view of Bhutan as you enter the Himalayas. It is one of the most scenic flights we have taken. We flew to Bhutan from Kathmandu and the views of the Himalayas were spectacular. Most people will fly to Bhutan from Bangkok, Delhi, Kolkata, Kathmandu, or Singapore. Only Druk Air and Bhutan Airlines fly to and from Bhutan. The Paro Airport is one of the most challenging places in the world to land an airplane. The runway sits in a narrow valley between high mountain peaks and lining the airplane up with the runway can be difficult. Only a handful of pilots are authorized to land here. At the airport, you will meet your guide for the week and start your tour of Bhutan. 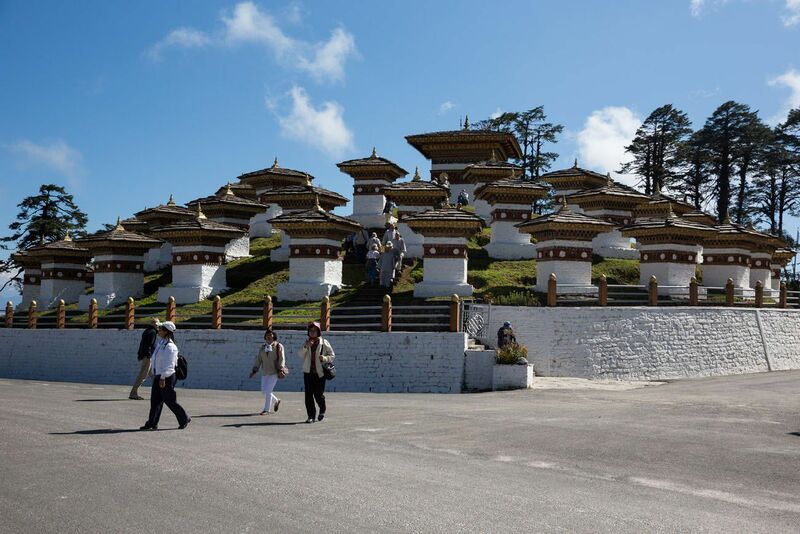 From the airport it is a 45-minute drive to Thimphu, the capital of Bhutan. 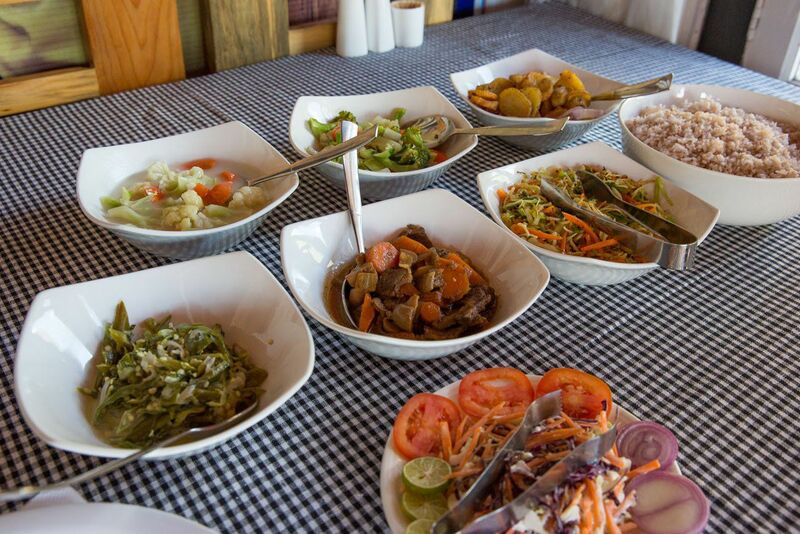 It was in Thimphu that we stopped for lunch, getting our first taste of Bhutanese cuisine. We ate traditional food: red rice, noodles, beef with carrots, assorted veggies, and green chilies with cheese. Chili peppers make it into a lot of the dishes here so be prepared for spicy food! The afternoon is spent in Thimphu. For a capital city, it’s a relatively small place. 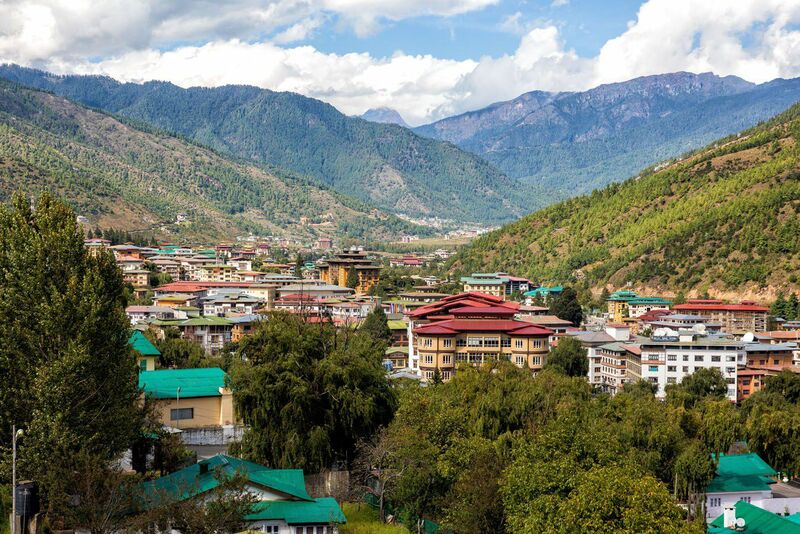 Thimphu is a beautiful, colorful city in an idyllic landscape, with bright blue skies, green mountains, and rice fields. Our guide, Kinga, took us to a local school, where young adults were learning various artistic jobs such as painting, weaving, embroidery, and woodworking. At the Bhutan post office, you can have customized stamps made with your photo on them. If you like to send postcards to friends and family when you travel, now you can include your face on the stamp! Who knew Bhutan could be so high tech? Visit the Takin Preserve, a “zoo” where the Takin, the national animal of Bhutan, is on display. Your day will end with dinner and downtime. Where We Stayed: Hotel Pedling. This hotel has large rooms with comfortable beds, flat screen TV’s, and a private bathroom. For a three star accommodation, this place is fantastic! After breakfast, it’s a short car ride up into the mountains to the Cheri Monastery. 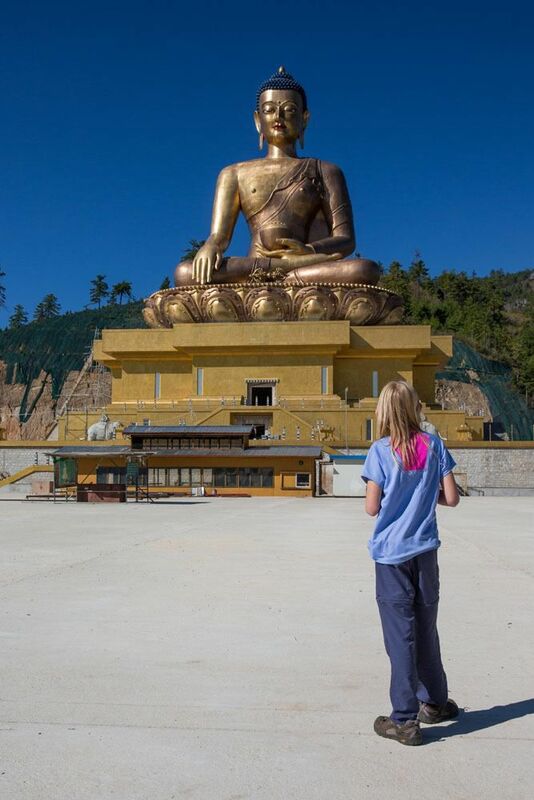 And for many people, this is probably your first visit to a Bhutanese Buddhist monastery. From the parking lot, it takes 45 minutes to 1 hour to walk up the hillside to the monastery. 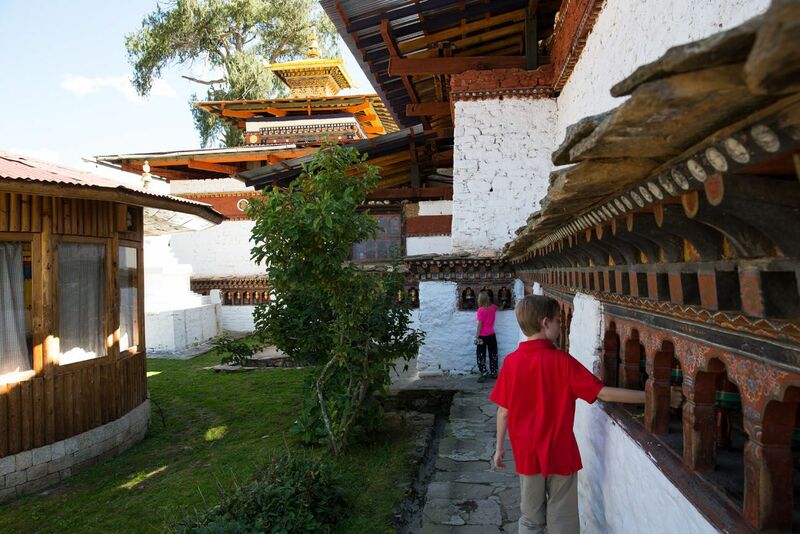 Spin the prayer wheels, visit the temple, and listen to your guide’s lesson about Buddhism and the monastery. After lunch in Thimphu, you have the option to visit a paper factory. Learn how paper is handmade and dyed with various pigments. 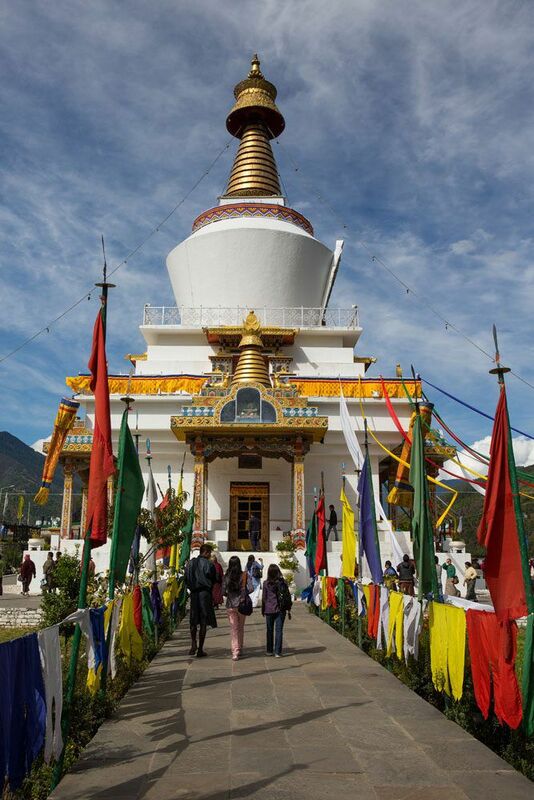 This stupa is one of the most recognizable religious landmarks in Bhutan. 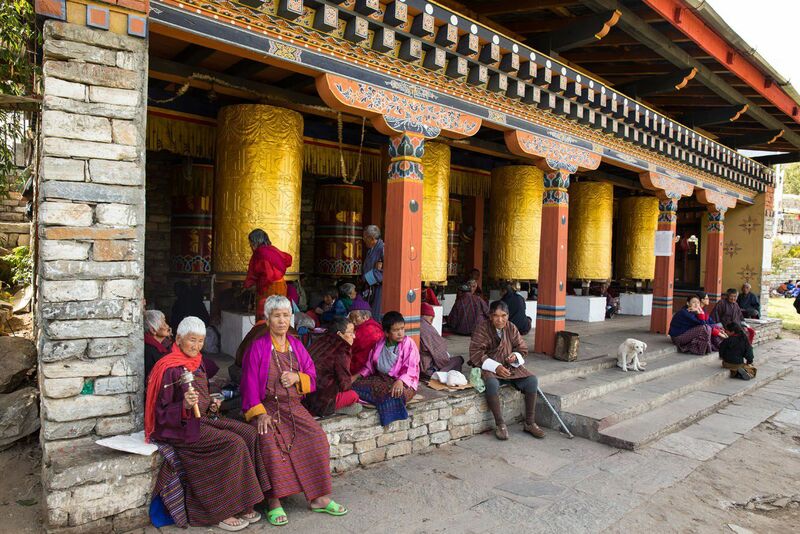 Many Bhutanese people visit this Chorten every day to spin the prayer wheels and circumambulate around the Chorten. 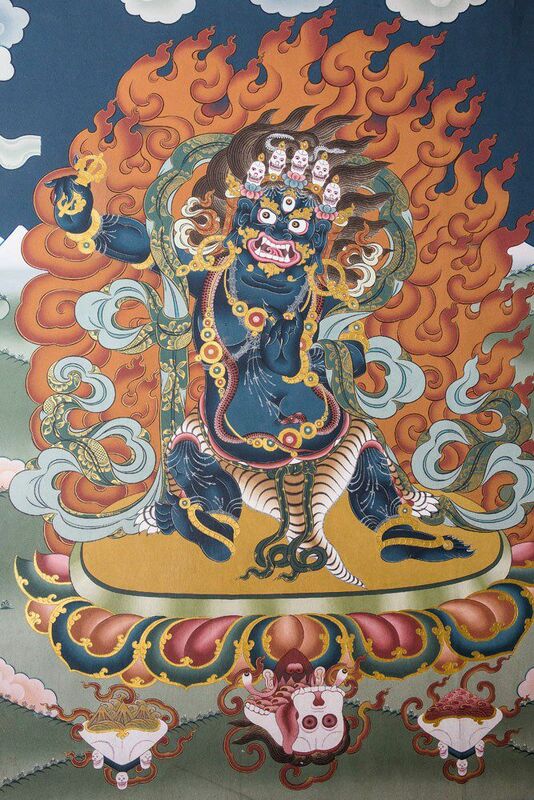 This increases their good karma, which gives them a greater chance for a favorable next life. This place with a funny name is the highlight of the day. 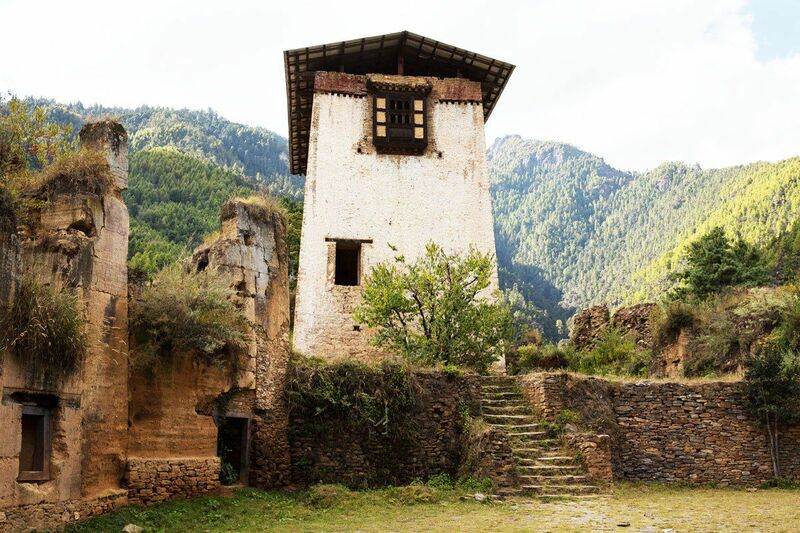 A dzong is a fortress, similar to the castles that were built in Europe. In modern times, dzongs are used as a seat of government and as a monastery. 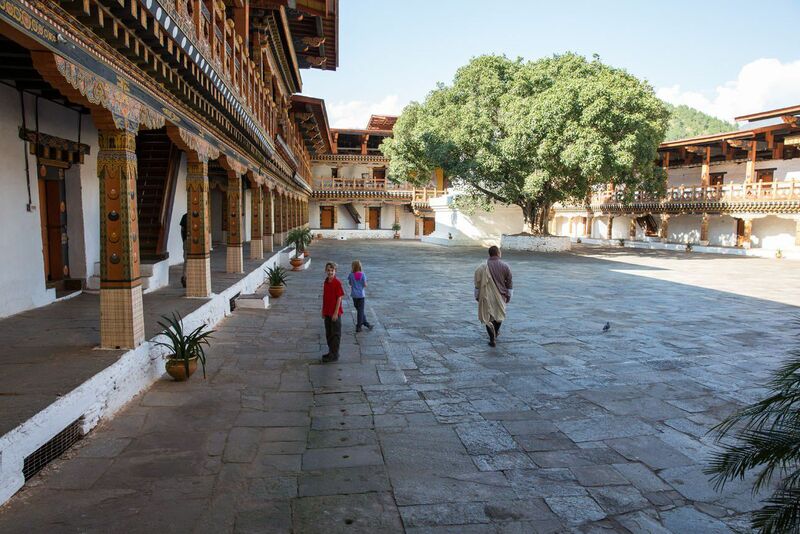 Walking around the courtyard of this dzong is incredible. It’s a beautiful spot, with a mix of visitors, tour guides, and Buddhist monks. Inside of the temple 1000 Buddhas are painted on the walls. Archery is the national sport of Bhutan. If you get lucky with your timing, you can watch young men during a practice session. Using hunting bows, they fire at a target 145 meters away (that is really far!). End the day with dinner in Thimphu. This is the largest Buddha statue in the world. It is made of copper, gilded in gold, and filled with 125,000 smaller golden Buddha statues. Why build such a large, ornate statue? The Buddha Dordenma statue was built to commemorate the 60th birthday of Jigme Singye Wangchuck, the fourth King of Bhutan. This statue sits on a hill overlooking Thimphu. 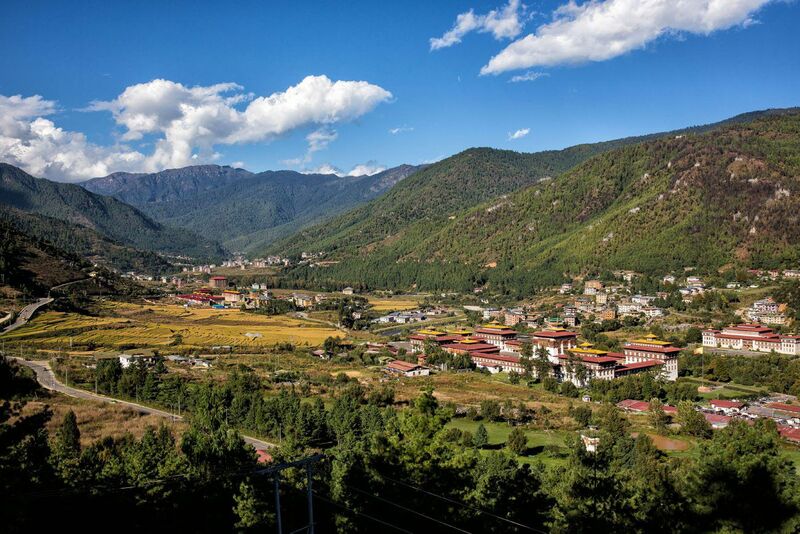 Take in one last view of Thimphu, because now it is time to travel to Punakha. The distance between Thimphu and Punakha is not long, only about 85 km. However, since you will be driving up and over a mountain pass on incredibly windy roads, this journey can take a long time. For us, it took over 3 hours to go this distance. We did this in 2014 while this road was undergoing a huge renovation project. Travel times are faster now (more like 2 to 2.5 hours) on better quality roads. Note: If you suffer from motion sickness, make sure you take your anti-nausea medication before leaving Thimphu. This road is extremely windy and by the time we reached Punakha, Kara was turning green. The Dochu La Pass is a high mountain pass on the road between Thimphu and Punakha. At 3,150 meters (10,330 ft), you have excellent views out to the Himalayas. Also at this pass are 108 stupas built as a memorial for the Bhutanese soldiers who were killed by Indian insurgents in 2003. After lunch in Punakha, it’s just a short ride to the Punakha Dzong. What a site to see!! This is the most impressive dzong we saw in Bhutan. 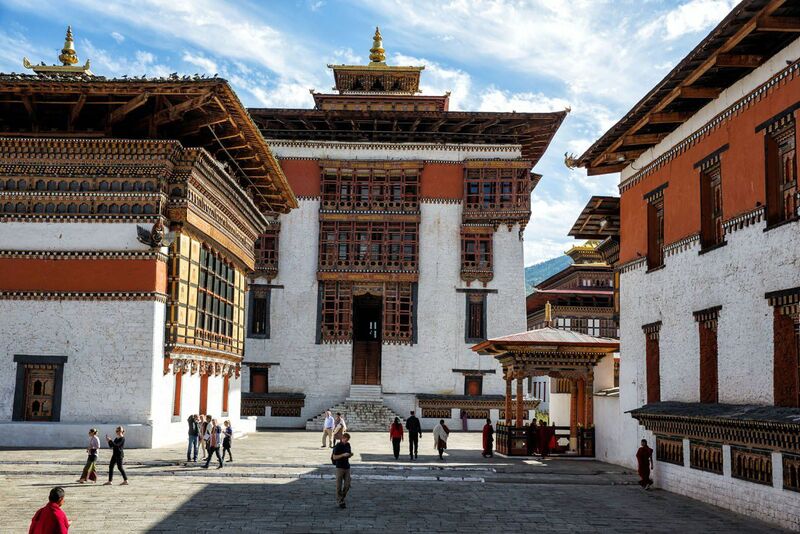 Cross the wooden bridge to the fortress and spend some time wandering the courtyard, admiring the colorful woodwork, and getting another lesson on Bhutan history and culture from your guide. The next site may be a little shocking for some people, but it is an interesting look into one of the cultural aspects of Bhutan. Chimi Lhakhang is the Temple of the Divine Madman. The Divine Madman was a Buddhist monk who loved alcohol and women. Chimi Lhakhang is now a temple of fertility and childless couples come here to be blessed in order to increase their fertility chances. As you walk from the town to the temple, you will see buildings adorned with giant phalluses and shops selling phallic souvenirs. It can lead to some interesting conversations, especially if you are here with children. Inside of the temple, you have the option to be blessed with a bow and arrow and a foot-long wooden phallus. 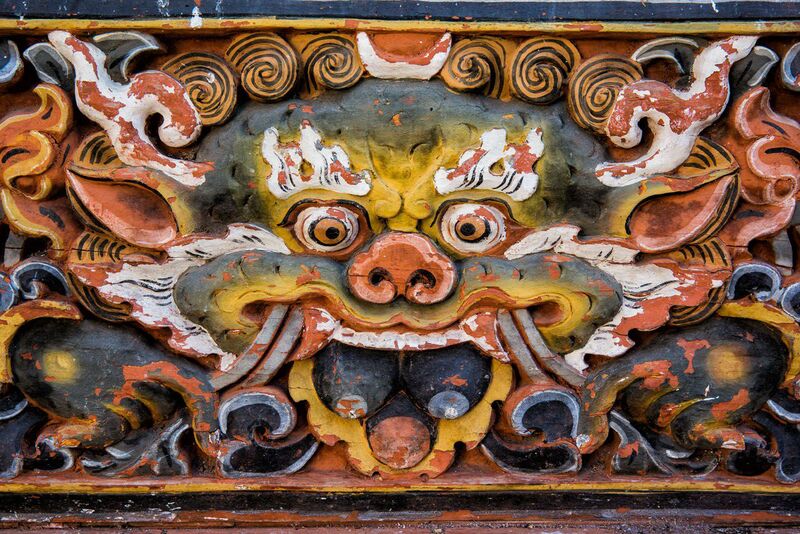 This is done for good luck and to keep evil spirits away. End the day with dinner in town or at your hotel. 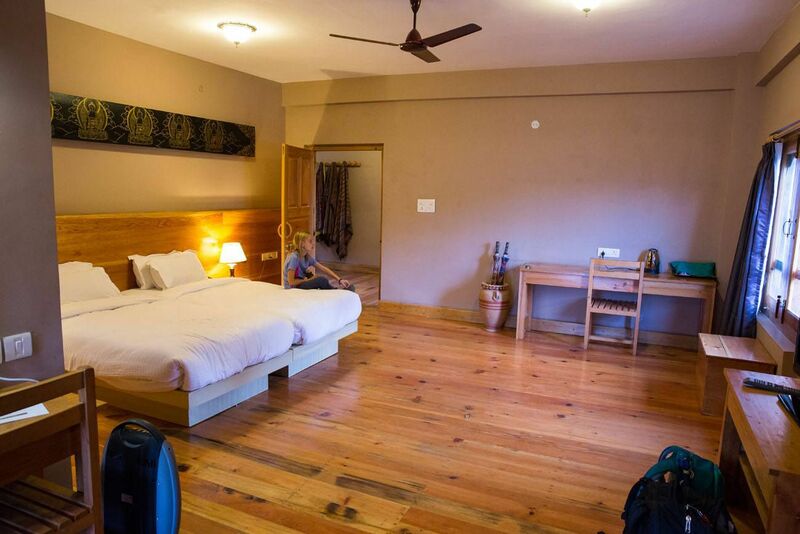 Where We Stayed: We stayed at Lobesa Hotel in Punakha. We had two giant rooms and each one had a great view of Punakha Valley. 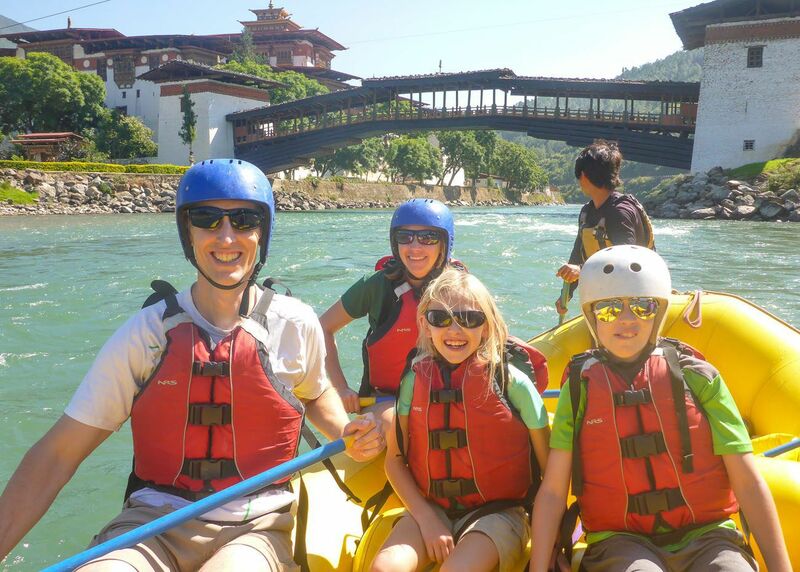 One very cool thing to do while in Punakha is to go white water rafting on the Mo Chhu River. The timing of your visit to Bhutan has a lot to do with whether or not this is possible. In October, when we did this, river conditions are rather sedate. But in the spring months, rafting the Mo Chhu River becomes a much bigger adventure. 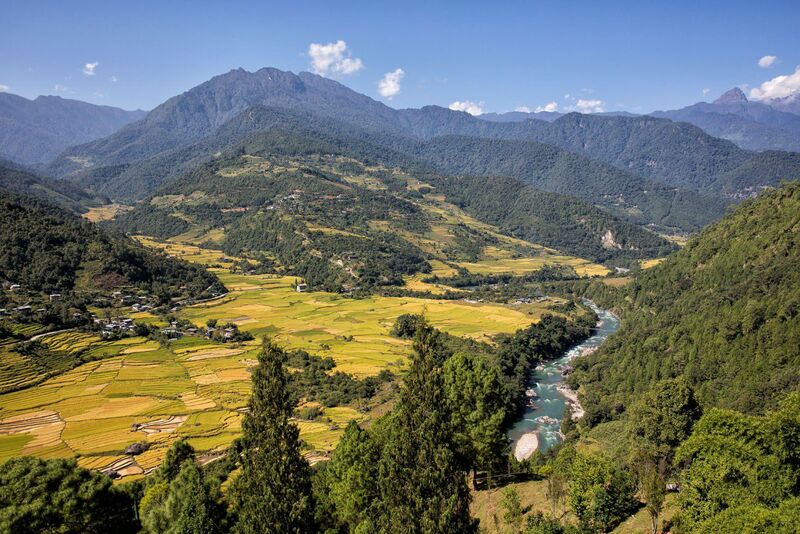 From Punakha, your guide will drive you about 45 minutes upriver. Before rafting, we made a quick visit to Khamsum Yulley Namgyal Temple. It’s a short, scenic walk through the rice fields to this temple. From here, the view over the valley, and the river you are about to go rafting on, is amazing. From the Khamsum Yulley Namgyal Temple, we donned life vests and climbed into our raft. For about one hour, we drifted down the Mo Chhu River, occasionally hitting bigger rapids. Because the water flow was low, it was more of a tranquil ride down the river than a hair-raising adventure, but even so it was a wonderful experience. The Punakha Valley is gorgeous and this is a unique way to see it. Gliding past the Punakha Dzong is an unforgettable experience. After lunch in Punakha, it’s a long drive to Paro. Take those doses of Dramamine, if you need them, and try to enjoy the scenic drive. 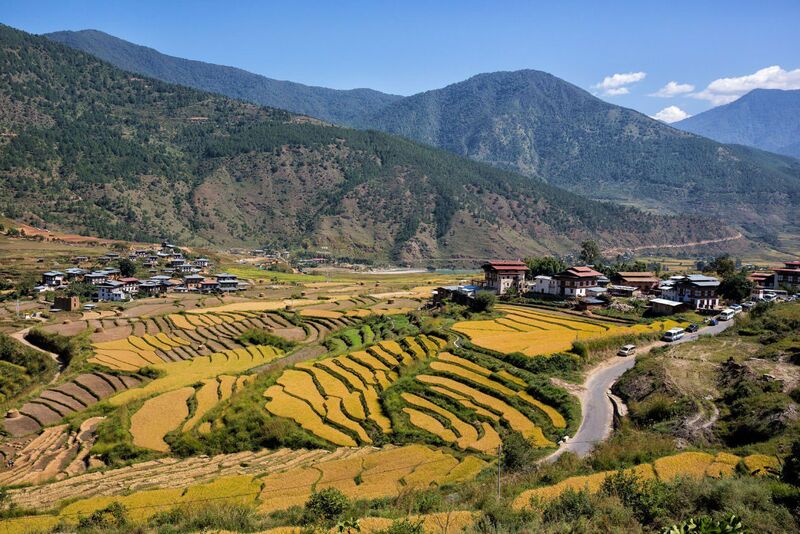 It takes between 3 to 4 hours to drive from Punakha to Paro. Where We Stayed: In Paro we stayed at Khangku Resort. In 2014, this place looked brand new and it was our favorite hotel in Bhutan. Again, we had huge rooms with flat screen TV’s and a private bathroom. The best part of this hotel was the balcony overlooking the Paro Valley and the runway of the Paro Airport. The National Museum is Bhutan’s premier museum. Inside of this round, stone building are thangkas (Buddhist paintings), historic artifacts, and festival masks. Our favorite part of the visit to the museum was the view over the Paro valley. 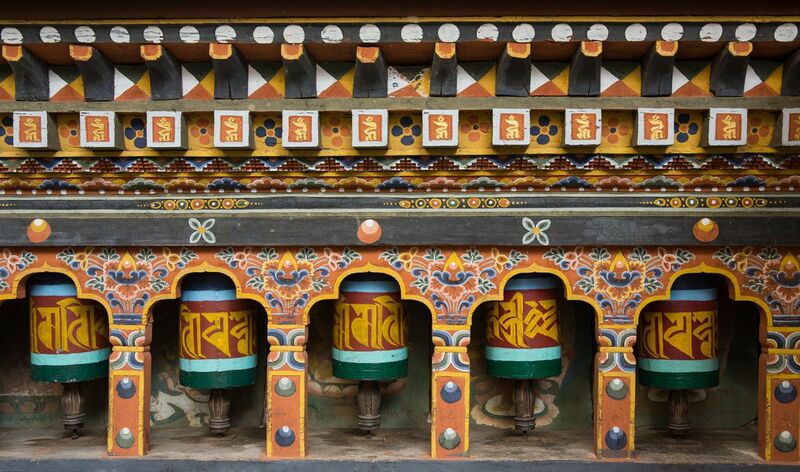 At the Paro Dzong, visit the temple, admire the architecture, and spin more prayer wheels. In some ways, visits to these dzongs and temples gets a little repetitive, but they are all unique in someway. Plus, you never know what you’ll see or who you will meet. 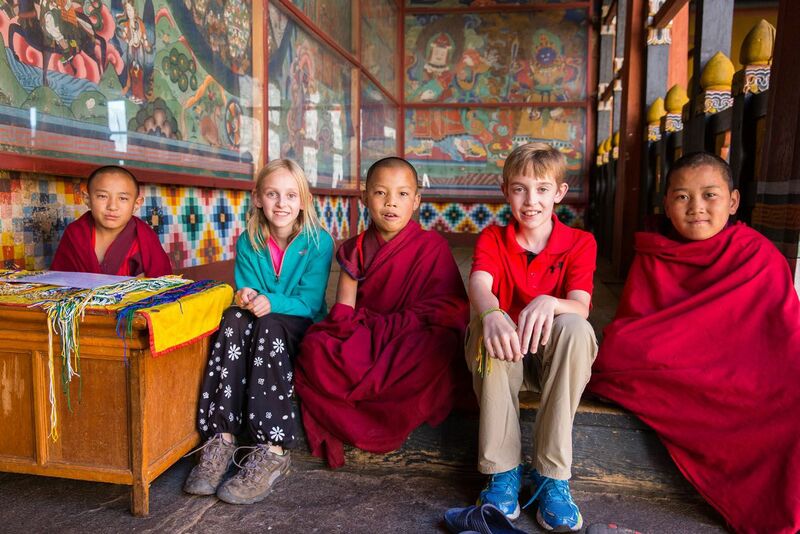 This photo that we took of Tyler and Kara with young Buddhist monks is one of my favorites of all time. 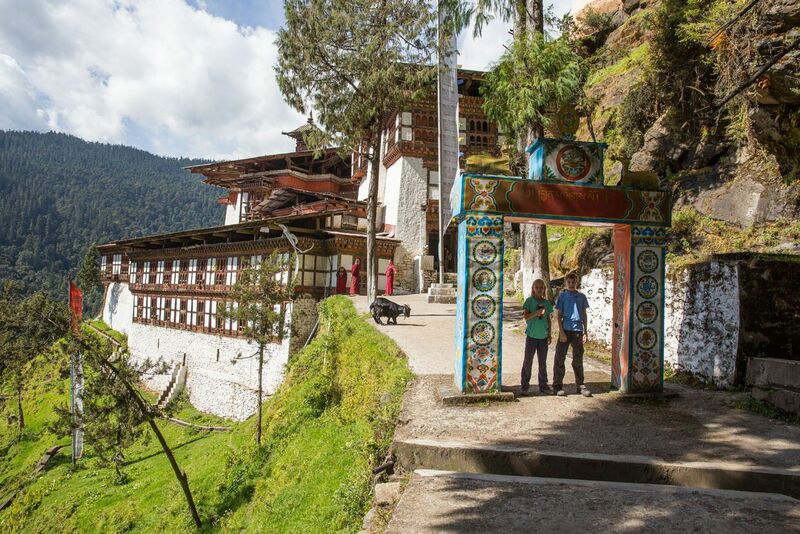 Kichu Lhakhang is one of the oldest temples in Bhutan, dating back to the 7th century. After lunch, and just when you thought there couldn’t possible be another dzong to visit in Bhutan, you will journey out to Drukgyel Dzong. These are the ruins of an ancient dzong that burnt down in 1951. It’s a cool spot to explore and during the drive you get a view up to the Tiger’s Nest monastery. 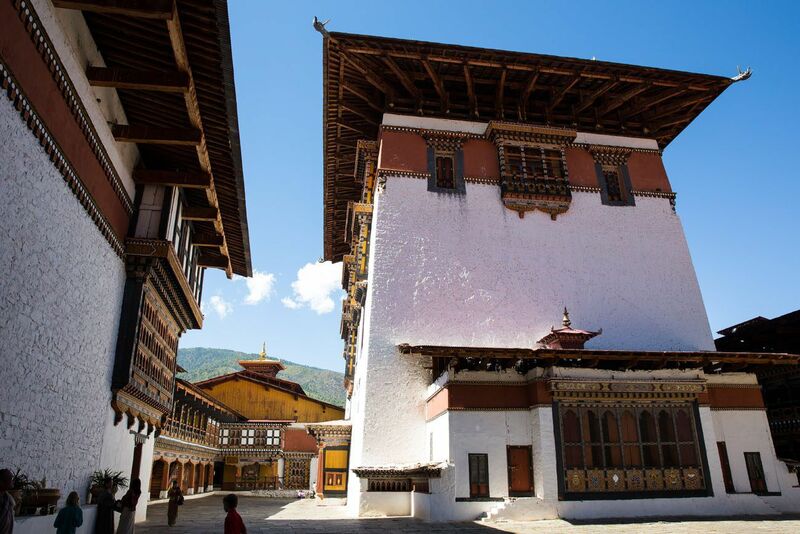 Spend the rest of the day shopping in Paro and end with dinner in town. 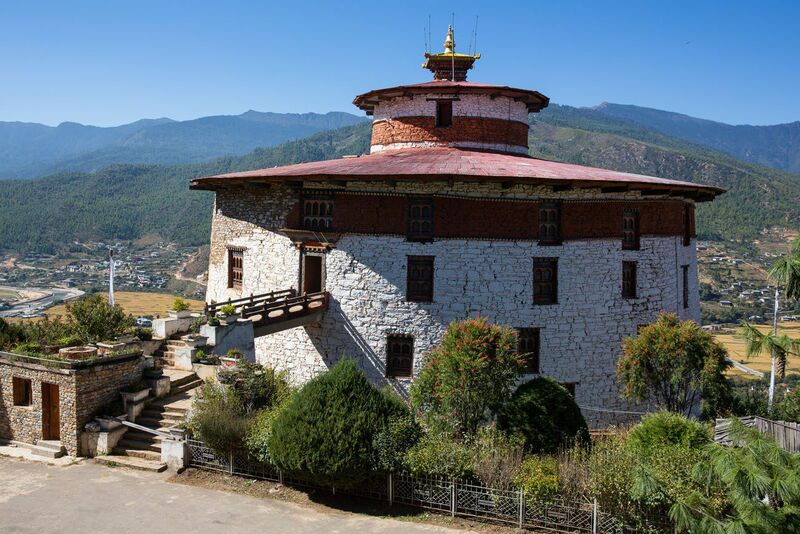 The grand finale to your tour of Bhutan is a climb up to the Tiger’s Nest Monastery (Takstang Monastery). 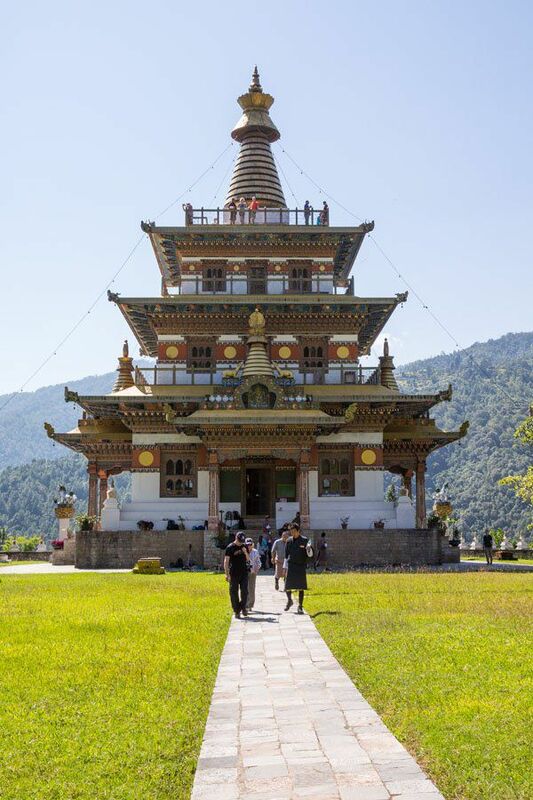 This monastery is one of Bhutan’s icons and a visit to Bhutan would not be complete without seeing this with your own eyes. The Tiger’s Nest Monastery is a small collection of buildings precariously perched on a cliff, 900 meters off of the ground. The only way to get to the Tiger’s Nest is by hiking. A visit here usually lasts 6 to 8 hours, with time to hike to the monastery, tour the monastery, and have lunch. It’s an extraordinary experience and many people’s favorite activity during a visit to Bhutan. End the day with dinner in Paro. Today you will begin your journey home. Or, for those with more time, continue the journey. The best time to go to Bhutan is during the spring months of March, April, and May and the autumn months of September, October, and November. During this time, the weather is generally clear with warm days and cool nights. The summer months of June through August are the wet season months. During this time, it is not unusual to have daily rainshowers, sometimes several per day, but they usually do not impact travel. You may not get the clear blue skies like you see in these photos. During the winter months of December, January, and February, it can get very cold in Bhutan and snow can close the roads in central and eastern Bhutan. We visited Bhutan during the third week of October. You can only visit Bhutan on a tour. And since there are over 1000 licensed tour guides in Bhutan, how do you know which one to choose? We used Bridge to Bhutan, a company that was listed in Lonely Planet’s Bhutan guidebook. Bridge to Bhutan is run by two brothers, Lotay and Fin. They arranged our visas to Bhutan, scheduled our transportation into and out of Bhutan, and helped us customize this itinerary. From start to finish, we had a great experience with Bridge to Bhutan. Our guide, Kinga, and our driver, Sonam, felt like friends by the end of the week. Kinga was very enthusiastic about teaching us about Bhutan and its rich culture, the accommodations beat our expectations, and everything ran smoothly. 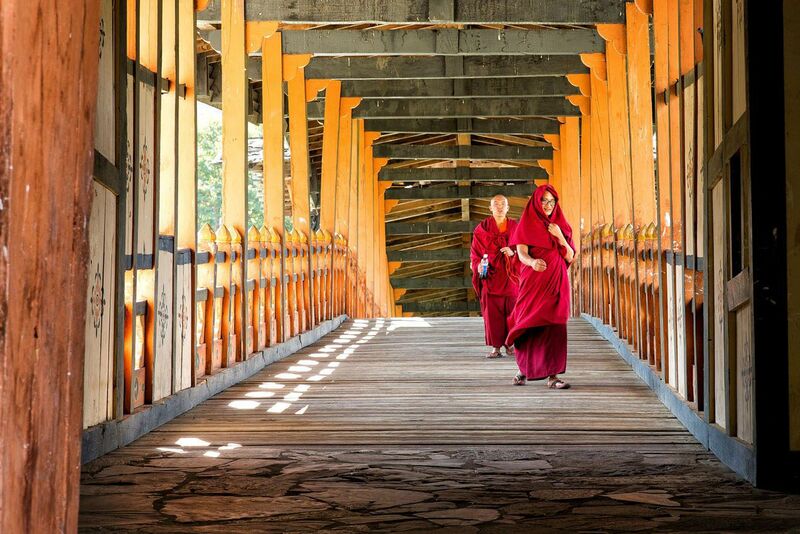 If you are looking for a reputable, knowledgeable tour operator in Bhutan, we highly recommend Bridge to Bhutan. In order to enter the temples, men must wear a collared shirt and long pants. Women must wear a long-sleeved shirt and long pants or a long skirt. Both men and women need to wear shoes with socks. Clothing that is not acceptable includes shorts, hats, and flip-flops. Every time you enter a temple, you must take off your shoes. On some days you will do this four to five times. I recommend wearing a pair of shoes that is easy to slip on and off. In general, Bhutan is a quiet, tranquil place. That is…during the daytime. At nighttime, the numerous stray dogs spend hours howling and barking, sometimes right outside of your hotel window. If you have a hard time sleeping through the noise of barking dogs, make sure you pack ear plugs. We loved Bhutan. But we did not love the food. The Bhutanese cuisine is rather bland with some chili peppers thrown in to add some heat. You will eat a lot of rice and chicken without much flavor. It’s like the cumin and turmeric and coriander that adds so much flavors to Indian food never made it to Bhutan. One thing that I did love was the chilies and cheese. Chili peppers grow in abundance in Bhutan. It’s not unusual to see loads of bright red peppers drying on the sun of the houses along the roadsides. The chili peppers are eaten with cheese on a regular basis. It’s very spicy and takes some getting used to but it’s definitely something to try while you are in Bhutan. 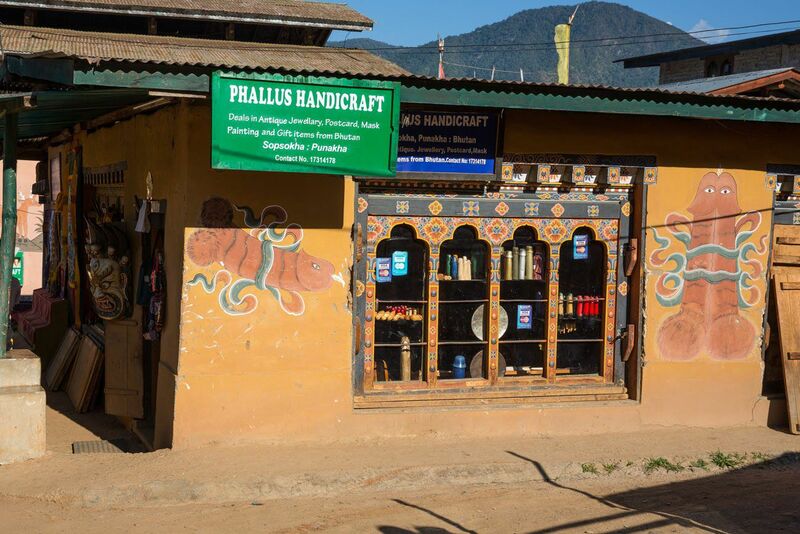 Here are a few recommended guidebooks about Bhutan. We used the Lonely Planet guidebook to pick out places to visit and experiences to have. I also highly recommend that you read Beyond the Sky and Earth by Jamie Zeppa before you go. This book was written by a college student who moved to Bhutan to teach English. It’s a story about what it is like to live in Bhutan and it gives a very accurate representation of the country. Do you have any questions about traveling to Bhutan? Comment below! I found your post a really helpful one! Hoping to visit Bhutan very soon. Bhutan is an incredible country and your post made it even more worth visiting. This will help me a lot in planning a trip to the Land of Thunder Dragons! I have visited Bhutan with my family from 19th Nov 2018 to 26th Nov 2018. 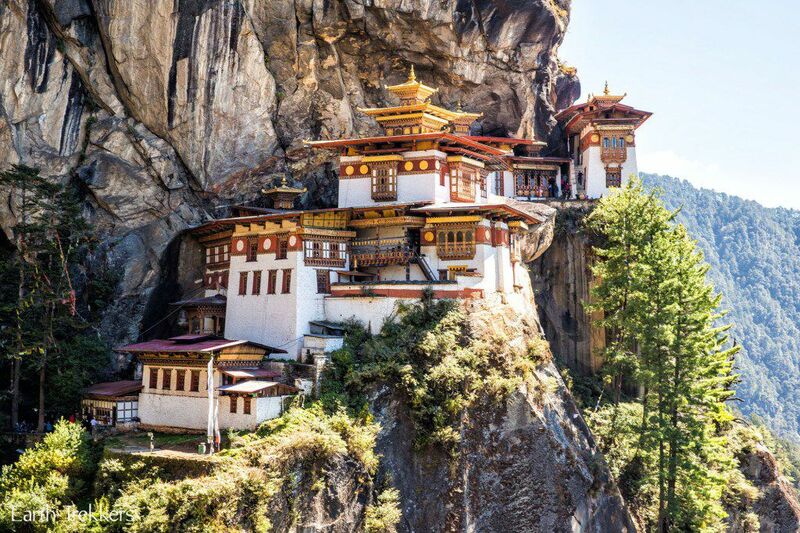 As i plan all my trips on my own and don’t prefer any travel agents or tour packages.So I tried to do an extensive research about Bhutan travel and I think the most important and confusing part is how to get the entry permit for Bhutan. There is lot of confusion regarding this and I thought that I should share the knowledge about my trip to Bhutan in the form of a blog which can help others plan their trip to Bhutan more easily. I visited this mystical land during the month of April. I had rented a car from a company named North East Cab. I traveled to almost every part of Bhutan. The people of Bhutan were very nice and friendly. There are many amazing monasteries a.k.a Dzongs. According to my opinion the Taktsang Monastery or ‘Tiger’s Nest offers one of the most spectacular views of the Paro Valley. 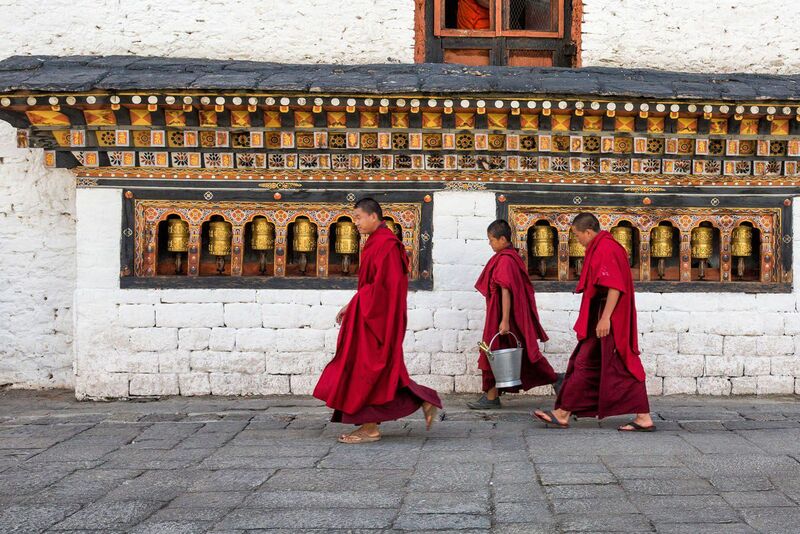 Bhutan is a country worth exploring as it is also known to be one of the happiest countries in the world. Apart from this the local cuisine is also very delicious. 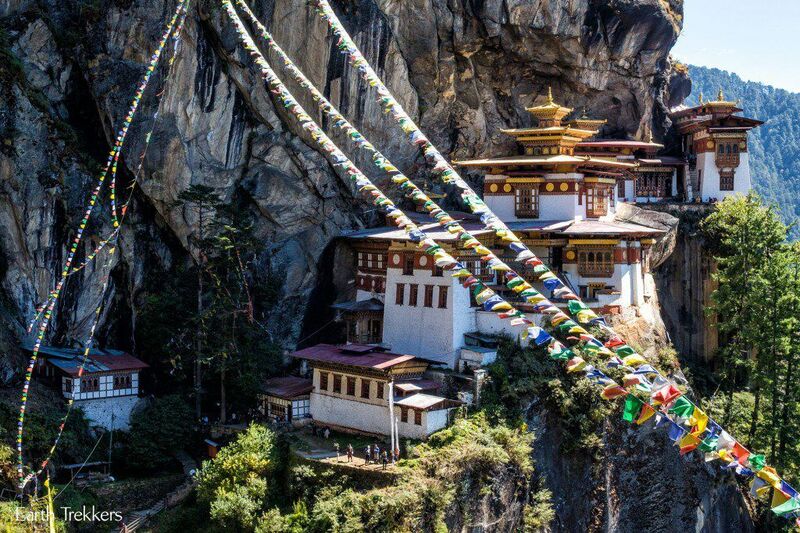 I love to visit Bhutan one day. Your blog has all the pictures and all your insights. Do you offer tours to some of these places? Thank you so much for this incredible review! It will definitely help in planning my upcoming trip. I will, however, be going with my parents who are elderly and not very active. They will not be able to participate in hikes – I am hoping that there will still be things for them to enjoy. Thank you again. This looks like such an incredible journey. 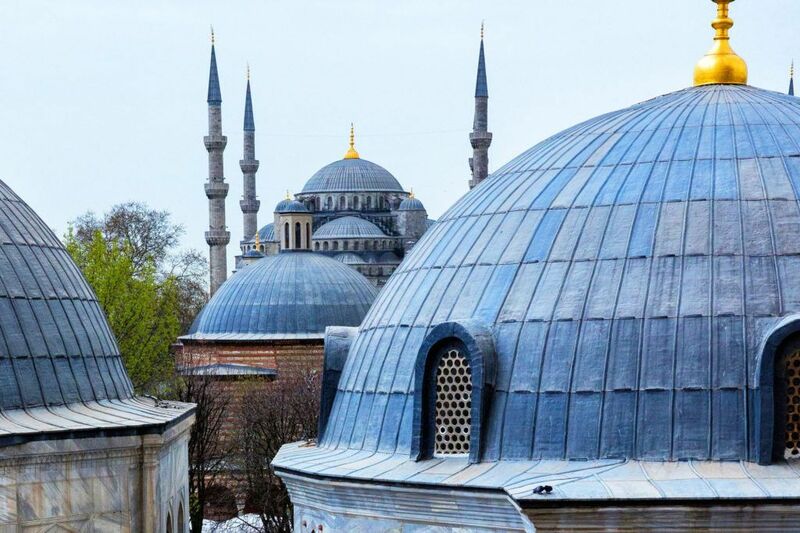 We decided not to go on our trip around the world as the daily tariff just seemed so high, but it is definitely still on our list of places to visit. In terms of your itinerary and activities was this set prior to your arrival? Also, how big are the groups you travel with?